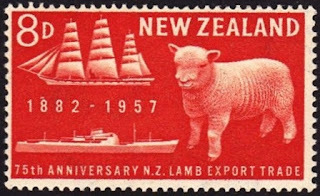 Virtual New Zealand Stamps: 1957 Anniversaries. 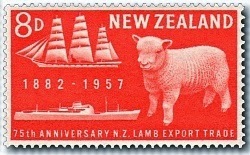 In 1957 New Zealand began the tradition of issuing stamps to celebrate Anniversaries. There had been some before this but only for cities and provinces. 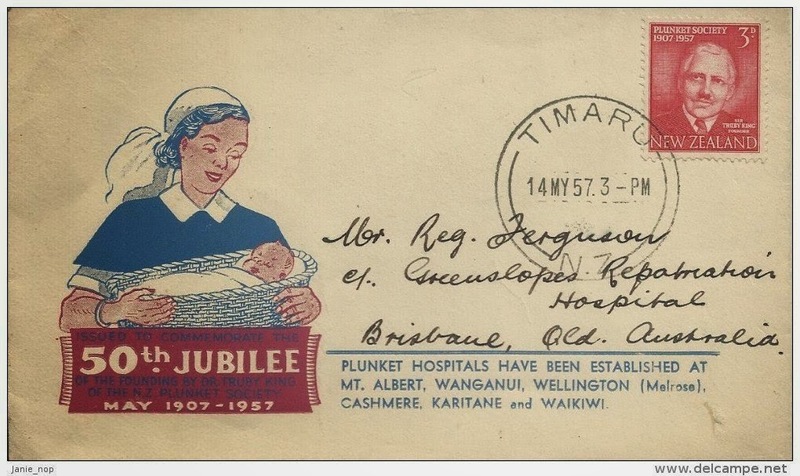 This changed in 1957 when NZ Post began issuing stamps celebrating the anniversaries of important events and organisations. The two issue below were actually released at separate times during the year but we have grouped them together for this post. First we have the 1957 Lamb Export 75th Anniversary and then we feature the 1957 Plunket Society 50th Anniversary. 1957 Lamb Export 75th Anniversary. 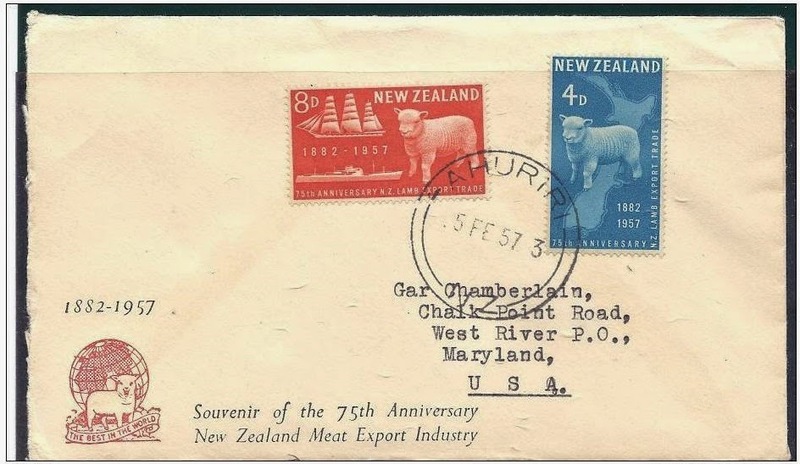 This stamp issue commemorated the 75th anniversary of the first shipment of frozen meat sent from New Zealand to the United Kingdom. The first shipment left Port Chalmers on 15 February 1882 on board the ship 'Dunedin'. It was a bold undertaking that could have ended in disaster. The sailing ship of 1,250 tons took 98 days to reach London with its cargo of 4908 sheep and lamb carcasses. Almost the entire shipment arrived in good condition. Farmers in New Zealand and those in other colonial countries had been trying for years to find a method of transporting some of the abundant meat to the thickly populated and more urbanised nations of Europe. Although New Zealand was behind Canada, Australia and South American nations in refrigerating meat, the success of the Dunedin's first voyage launched the meat industry in this country. As a result of the successful voyage of the 'Dunedin' the type of sheep raised in the country changed from predominantly Merino to crossbred animals with better meat value. The industry developed so quickly that within ten years, 17 freezing works capable of handling 3.5 million carcasses a year had been established. Soon meat had become the major export industry of New Zealand where it would remain until being knocked off its leading position by the grown dairy Industry. Today 2015, The shipment of meat from New Zealand is still one of our larger primary export industries. 4d - New Zealand Map and Lamb. 8d - Lamb Export Ships - Then and Now. Neither of these flaws below are that noticeable and we did hesitate to include them. 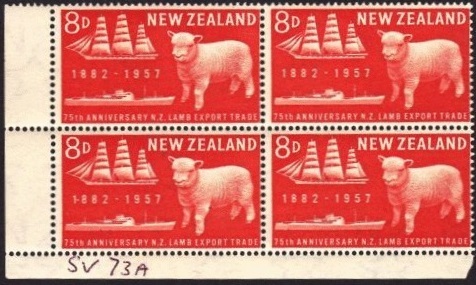 1957 Lamb 8d R 8-11 - White dot above 1882. We feature two covers from this issue. 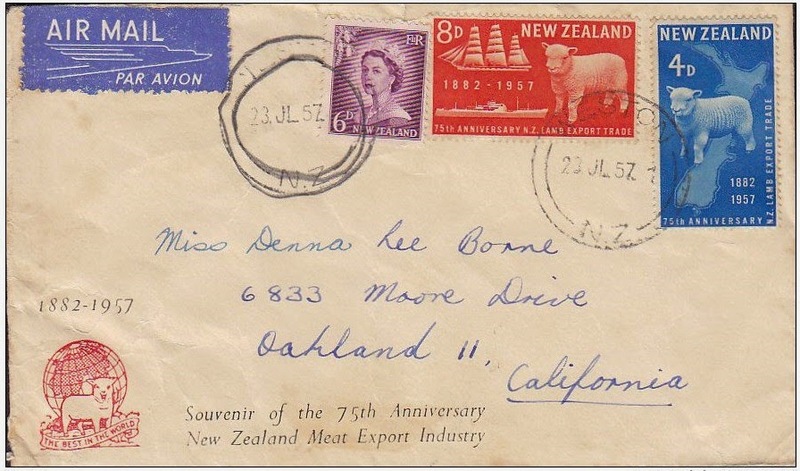 The first one above is a pre-printed First Day Cover, sent from New Zealand to the USA. Below is another cover showing this issue along with a 6d from the 1955 Redrawn Queen Elizabeth II definitives, This cover was posted on the 23rd July, 1957 so can not be regarded as a FDC. 1957 Plunket Society 50th Anniversary. Sir Frederic Truby King (1 April 1858 – 10 February 1938), generally known as Truby King, was a New Zealand health reformer and Director of Child Welfare. He is best known as the founder of the Plunket Society. The establishment of the Plunket Society on 14 May 1907, for which Truby King is best known, was to apply scientific principles to nutrition of babies, and strongly rooted in eugenics and patriotism. Its 1917 "Save the Babies" Week had the slogan "The Race marches forward on the feet of Little Children". Truby King's methods to teach mothers domestic hygiene and childcare were strongly promoted through his first book on mothercare, Feeding and Care of Baby, and via a network of specially trained Karitane Nurses and a widely syndicated newspaper column, Our babies, written by King's wife Isabella. Apart from nutrition, Truby King's methods specifically emphasised regularity of feeding, sleeping and bowel movements, within a generally strict regimen supposed to build character by avoiding cuddling and other attention. 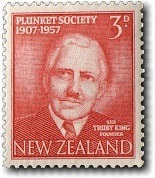 Sir Frederic Truby King died in Wellington on 10 February 1938. He was the first private citizen in New Zealand to be given a state funeral. Twenty years later he was the first New Zealander to feature on a New Zealand postage stamp.